Yesterday, I wrote about the arc of the Disney Studio from 1940-1950, including the fact that World War II made a dent in the cash flow. Once the war broke out, Disney could no longer recoup money that was earned in Europe, especially in Great Britain. After the war, legislation and political battles kept that prohibition in place. So what could Disney do with that money? The answer, one that only Walt Disney would come up with, was to create new films, using the money that was captured to produce films in Great Britain. Turning the negative of a trapped cash flow into a positive was a classic Walt move. 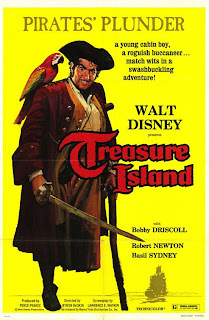 Four films would eventually be made during the late 1940s and early 1950s, the first of which would be Treasure Island, a telling of the classic Robert Louis Stevenson pirate novel. Previously, Walt and his team had been working through ideas of how to adapt the novel as an animated film, but with the complication of having the money trapped overseas as well as the growing number of actors who worked with Walt and team on various live action projects, the idea of a live action version came rapidly. 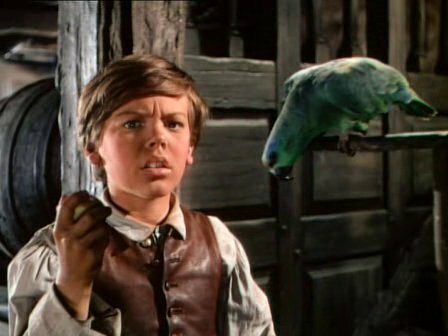 Bobby Driscoll, who had appeared in Song of the South and So Dear To My Heart, was soon chosen to be Jim Hawkins, the young boy who comes into possession of the treasure map and is sucked into the world of pirates. Robert Newton, a well known British actor, was chosen as Long John Silver, the pirate adversary. With cast in place, the crew turned to finding ways to shoot this film, which included finding a ship that would serve as the back drop to the majority of the film. Much of the film was actually shot at sea, making it an expensive and difficult shoot. Further adding to the problems on the shoot was the fact that Driscoll could only get a work permit to be in Britain for 3 months. So, the central character in the film was on a shortened schedule and his scenes had to be shot first. Despite these issues, though, the final film was completed and released to theatres in July of 1950. In the end it became a pivotal film for many reasons, but not necessarily financial ones. Newton’s portrayal of Silver may seem rather predictable today, but in fact it set the tone for “pirate speech” as we know it. The adaptation was probably the most loyal of all filmed adaptations of Treasure Island, and would serve to launch a later sequel and television adaptation starring Newton. 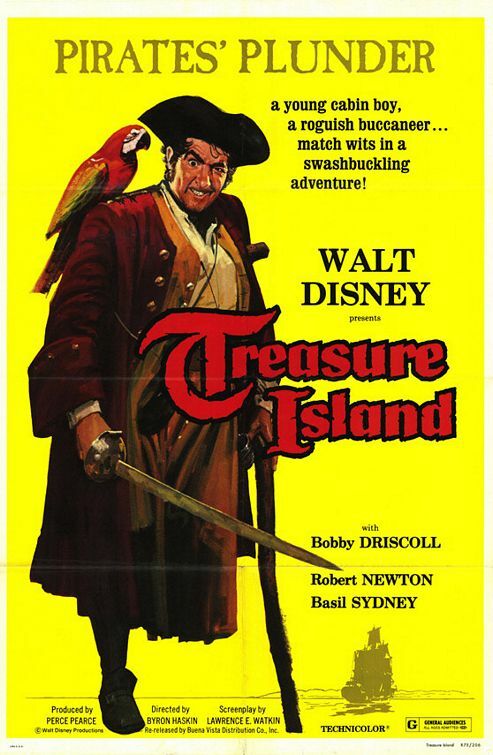 In the end Treasure Island did not make a lot of money, but it did well enough that Disney was able to get more out of it through re-airs, TV airings and later home video releases. How is the film itself? Come back tomorrow and we will discuss.